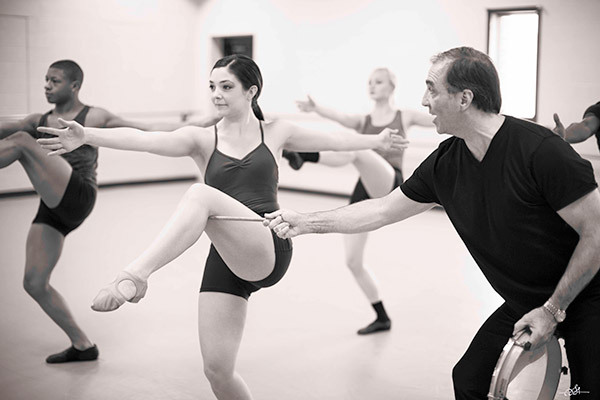 From June 6th to 8th Jazz Choreography Enterprises hosted a series of dance classes taught by renowned instructor and Jazz Project choreographer Bob Boross. His classes focused on Matt Mattox Freestyle Jazz Dance technique. The first was a beginner/advanced beginner level class meant to introduce people to the style, and the next two were intermediate/advanced, building on the foundation of the introduction. Boross began the first class by explaining that Mattox was one of the early jazz dance teachers. There were no real jazz classes when he started teaching in the 1950’s, but in the 1960’s, Mattox and Luigi were the big jazz teachers in New York City. Mattox’s technique combined ballet with the isolations of choreographer Jack Cole and added arm movements and tap-influenced footwork for complexity. “He’s called a jazz dance person, but his technique is really sixty-five percent ballet,” Boross said. Mattox described his technique freestyle (a term coined by choreographer Eugene Loring) because his goal was that dancers would have the freedom to perform any style. Mattox left the United States in 1970, opting to move to Europe. For this reason his style isn’t widely known or taught in the U.S., and Boross, who studied with Mattox, is one of the few teachers carrying on the tradition outside of Europe. The classes opened with a series of exercises meant to warm up the dancers. These exercises were primarily aimed at “controlling individual parts of the body,” as Boross put it. He explained what the different motions were meant to accomplish and corrected dancers on their positioning to be sure they were using the optimal muscle groups for movements in order to avoid strain or injury. “It’s very cranial,” he said of the technique as the students worked through the exercises. He often taught the arm and foot movements for the exercises separately, but it still took a few tries for many of the students to combine them correctly. He explained that the warm-up wasn’t meant to flow easily so much as it was meant to make you think about what you were doing. By the final class the group moved through the warm-ups more quickly, and Boross continued to introduce new and more challenging ones. On the last day he said that Mattox instructors would often mix and match the different isolation movements once the students were more familiar with them so that each class was always a little different. Each of the classes also featured a combination displaying the style mixture of ballet grace and jazz isolations. On the first day the combination featured a mix of jumps, kicks, and turns, but despite all of the movements Boross joked that it was probably easier than the exercises because the sequences flowed together more. The students seemed to enjoy the classes, and some were able to attend all three, including a group from NYU. Following the final class, I asked them to share some of their thoughts on the technique. “I find something unique about it each day,” said Samantha Morales, who wanted to take the classes after having taken an introduction to Matt Mattox technique elsewhere. “The ballet base helps to strengthen all of the muscles,” said Wipavee Pantoompong, commenting on what made the style unique to her. Bob Boross was also interviewed by Dance Teacher magazine while he was in New York, and an article about him is scheduled to appear in October. Skye Mattox, Mattox’s granddaughter, demonstrated the technique for the article. Missed the Mattox Dance class – waiting for the next one . Love Jazz!!! !